To lead our Morning Communion Service, we welcomed Retired Minister Rev Martin Camroux from Colchester. On this Mothering Sunday, Martin lead us in thinking about the love our mothers show and how this reflects God’s love to us. His sermon can be heard here. Order of Service for 31st March 2019. Lent Liturgy : Purple Robe and Crown of Thorns. Singing The Faith No. 88 “Praise to the Lord the Almighty”. Singing The Faith No. 119 “God of Eve and God of Mary”. Reading: Hosea chapter 11 verses 1 to 4. Reading: Luke chapter 21 verses 1 to 4. 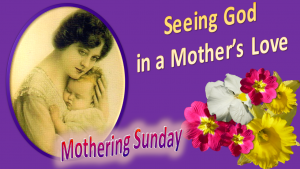 Poem: “Mothering Sunday” by Stanley Cook. Singing The Faith No. 611 “Brother, Sister, let me serve you”. SERMON: Seeing God in a Mother’s Love. Singing The Faith No. 81 “Now thank we all our God”. Holy Communion beginning at page 203 in the Methodist Worship Book. Singing The Faith No. 526 “Lord of all hopefulness”. Our united evening services with the Town Centre Parish have been suspended until further notice, but our United Lent Course continues to be held at Castle on Wednesday Mornings until Easter.